I love nothing more than getting together with my friends, sharing a joke, and spending entire evenings laughing with my nearest and dearest companions. 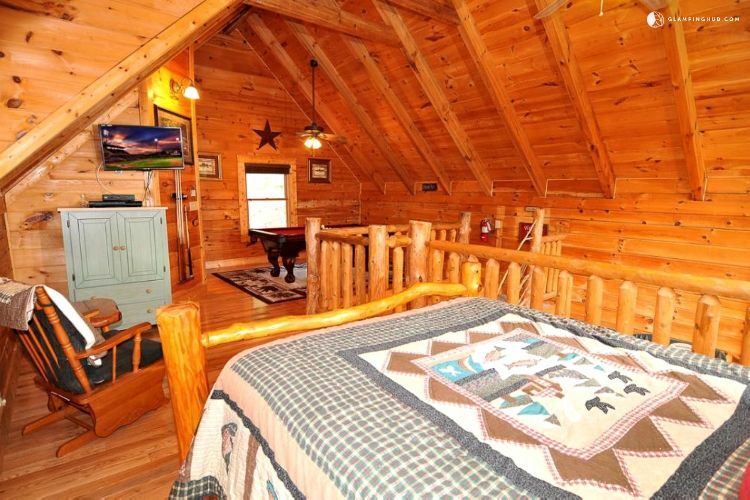 Escaping to a log cabin retreat is the perfect way to share recreational time, as these quiet, simple living spaces have few distractions, meaning we entertain each other with music, conversation, and games. 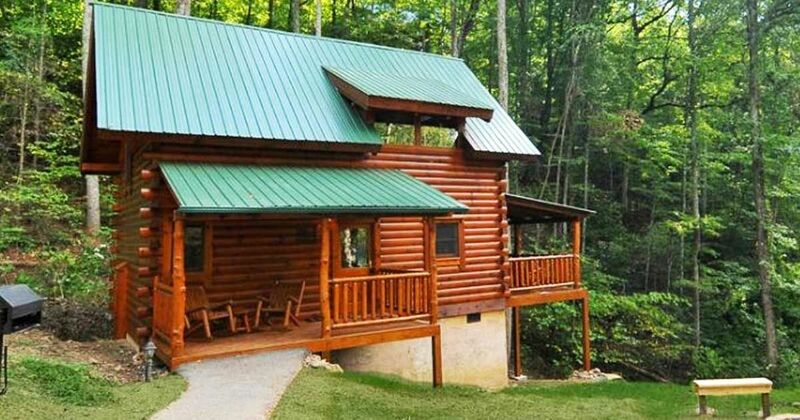 This log cabin is located in the Great Smoky Mountains near Knoxville, TN, and is available for vacation rental purposes on Glamping Hub. 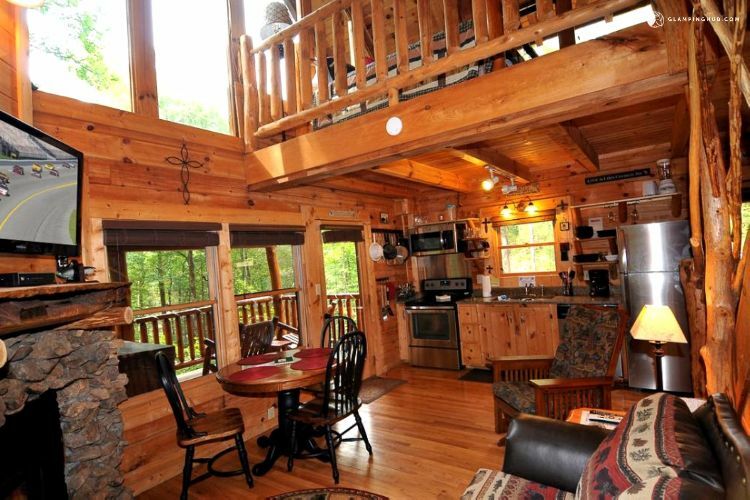 This ample-sized cabin has a bedroom and a sleeping loft, meaning it can house four guests - perfect for a group of friends looking to escape the city. This rustic retreat has a few surprises inside which will help you to get the party started. Shall we take a look? We enter the cabin via the front porch to be greeted by a light-filled open main room which encompasses the lounge, kitchen, and dining set. 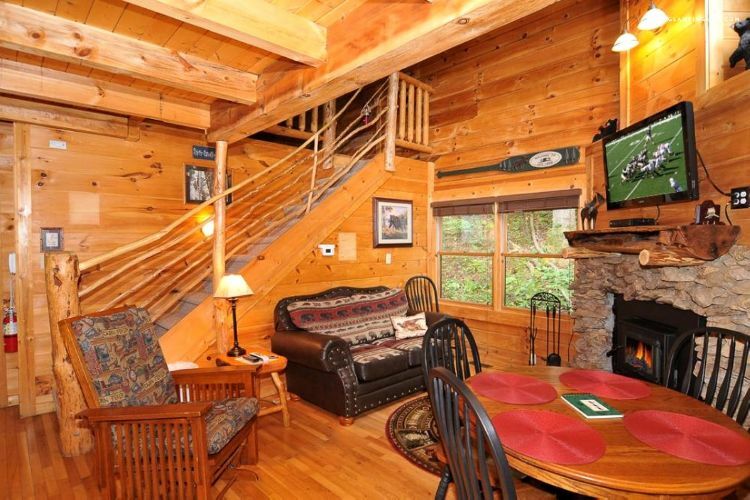 The quality of wood used in the floors, paneling, and beams is inviting, creating a cozy environment for your gang. 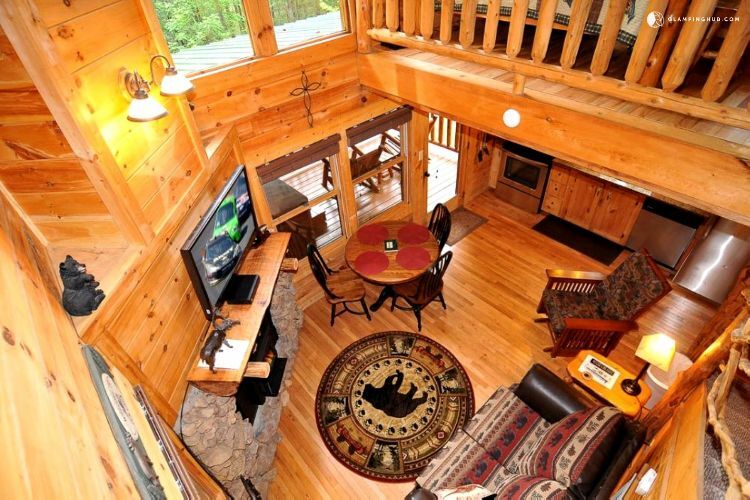 Taking a top-down view, we notice the room has plenty of comfortable furniture for everybody to relax. You can eat indoors on the four-person dining set, or take lunch outside onto the deck. The living room has plenty of large windows for constant woodland viewing. 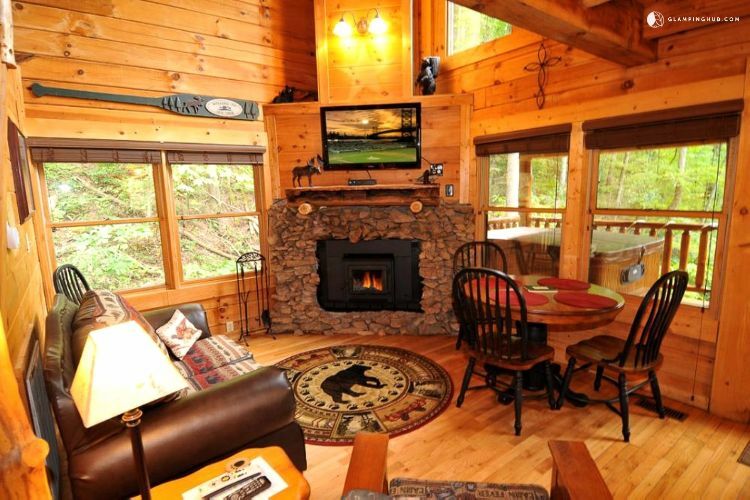 The robust stone-stacked fireplace is an attractive fitting and will easily heat this cozy cabin. 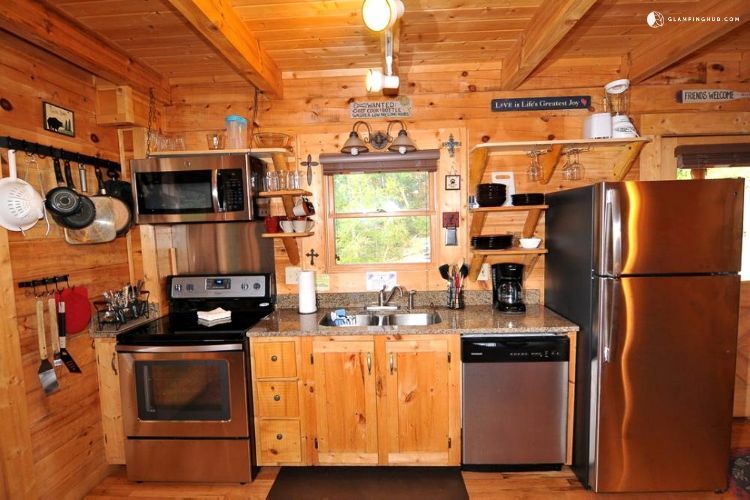 The fully equipped kitchen makes meal preparation a simple task, with attractive stainless steel appliances. The deck area includes barbecue grills, giving you multiple cooking options. The ground-floor master bedroom is simply furnished with a queen-sized bed. 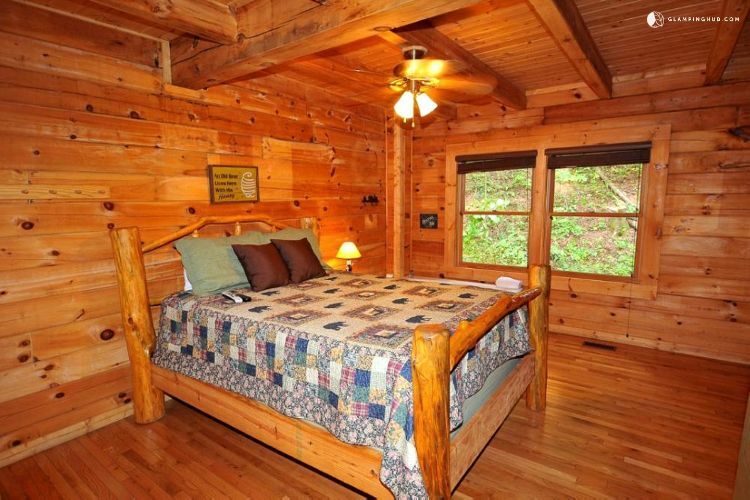 The ever-present smell of wood makes this an idyllic and relaxing place to sleep. 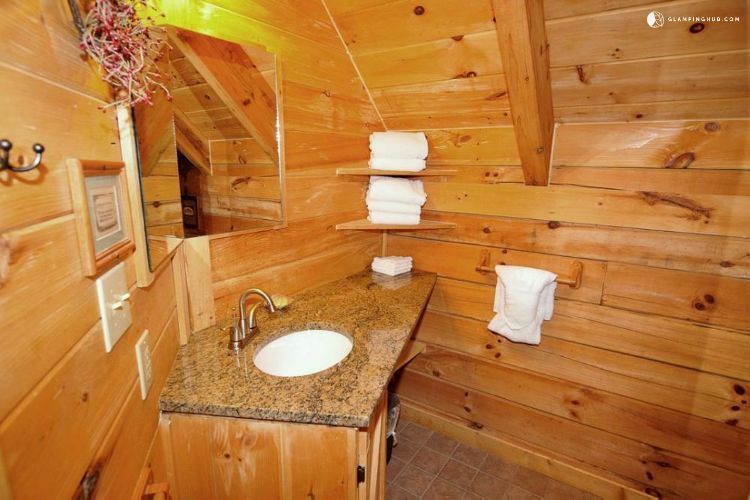 The master bedroom has a private ensuite bathroom, while the cabin features a second, full bathroom with a jacuzzi tub. As we return to the living room, we notice the cute wonky handrail which leads us up to the loft area. The loft space is open to the main living room below, benefiting from the natural light and fresh air. The queen-sized bed must be an amazing place to wake in the morning, especially with the day's first light. 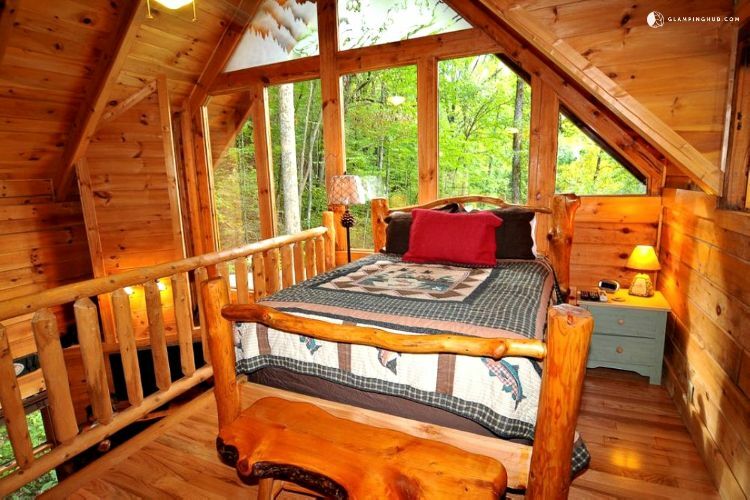 Looking back into the loft, we notice this cabin's first secret. How cool is this? 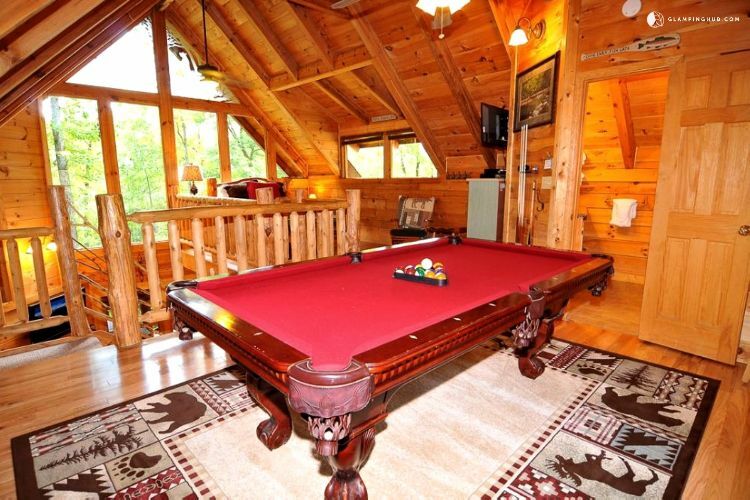 A group of friends could easily remain entertained on those wet and windy days by gathering around the pool table. And when the weather is good? 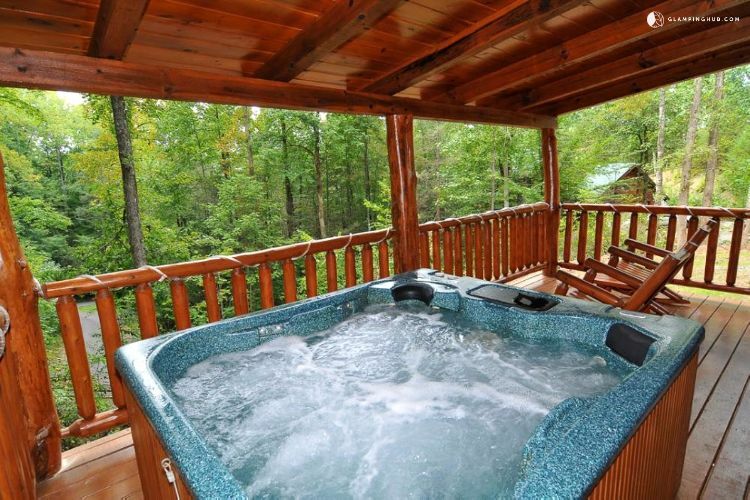 Why not enjoy the hot tub! Is this what you look for in a vacation? SHARE on Facebook to find out which of your friends wants to go with you!